In about eleven hours we'll be boarding our airplane in Narita. And in just over twenty-four hours we'll be walking through the Denver terminal. What a successful trip we've enjoyed. Karen Gerrity, Shannon Reddick, and I agree wholeheartedly how terrific this group of young people is. They represented themselves, Broomfield, and the United States so very well. They bolted enthusiastically out of their comfort zones daily. And they were paid handsomely in return. If you could only have witnessed the mark they left on the citizens of Ueda. And the mark that citizens of Ueda left on us. Japan is a land where public reserve is a genetic trait. The closing ceremonies, however, overcame nature's grip on our hosts. Our hosts dressed us (and I mean, three people literally dressed each of us!) 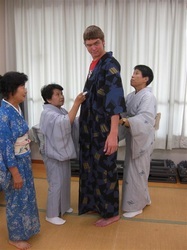 in summer kimonos. Once in our Japanese finery, we made our entrance into a roomful of applauding hosts and dignitaries. It was the fourth or fifth time we entered a room to such applause during our stay. Official recognition of the trip and an invitation to return to Ueda was offered. We enjoyed a slide show of our nine days in Ueda. (Talk about having your life flash in front of your own eyes!) And we enjoyed traditional Japanese music, along with a light dinner. Then, we turned the cultural tables. The Japanese gave us traditional music; our gang gave them a rap that Shelby and Lisa wrote when we first arrived in Tokyo. In show business vernacular, we "killed." 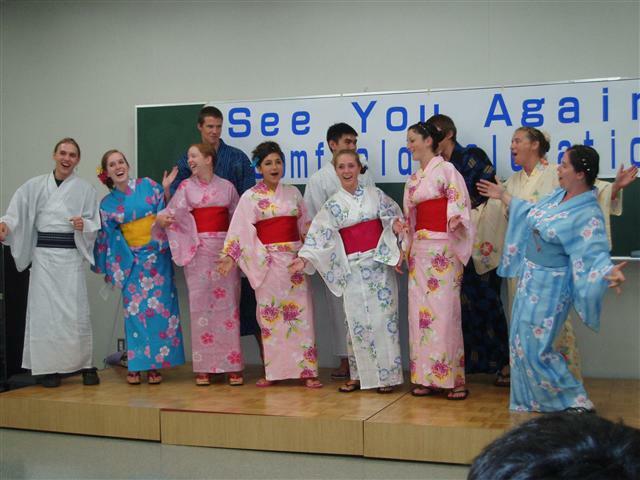 Resplendent in traditional summer kimonos, our young ambassadors never missed a downbeat—and their audience responded in kind, clapping along wildly and cheering even more so when the rap ended. We concluded our thanks with the first chorus of "Auld Lange Syne" (which is sung traditionally at Japanese graduations and used throughout the country by retailers at closing time), presented each of our host families with a long-stemmed flower, and the tears flowed from our hosts in response. The Japanese—and we—also snapped another billion or so photos of every imaginable combination of Uedan and Broomfielder. (If you want to know what it's like walking down the red carpet on Academy Awards night, join the next trip to Ueda. The Japanese make the paparazzi look like pikers.) Invitations to visit Ueda were offered again. Promises to return were made again. The local television station, which had covered virtually our every move all week, assigned a camera crew to interview our young ambassadors. More photos. More new combinations of people. Then it was time to board the bus to Ueda Station. Americans filled only about a third of the seats. Our hosts crammed into the rest. Another bunch drove their own cars to the station where more small gifts were passed our collective way, mostly tiny mementoes of our stay and thoughtful snacks for our return trip. More photos were taken of even more just-discovered combinations of people. More thanks. Lots of laughing and bowing and then, as the Shinkansen (Bullet Train) slowed to its very brief stop at the station, the tear ducts opened again—but with greater volume than Saturday night. The Japanese students passed numerous love notes to our students. Sincere hugs were cheap. Still more invitations to return were offered. And more promises to return were made. Our bags were thrown onto the train, and thankfully (at least for me), Japanese efficiency brought the sayonara scene to its teary-eyed conclusion as the train's staff demanded we board immediately. 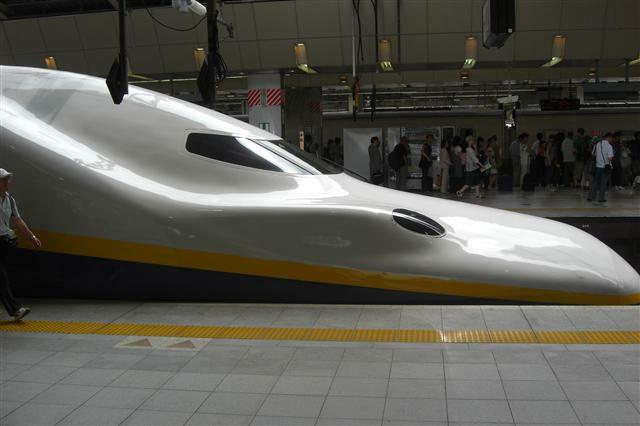 After all, there is good reason the Shinkansen travels 200 kilometers an hour; they have a schedule to maintain. Then, with the blink of a camera's flash, Ueda was quite literally behind us. And home awaits us ahead. Even though we face a fifteen-hour flight, the International Date Line plays its tricks on us today. We depart Japan at 6:00PM, and we arrive in San Francisco at 11:20AM or so—about six and a half hours before we leave Japan! If United Airlines surprises us all, we'll be in Denver minutes before we ever left Tokyo. Who said time travel was impossible? Our luggage is jammed with dirty laundry and generous gifts we received and lots of items for you guys. Even more important, our memories are jammed with impressions of a place unlike Colorado, of a culture and recorded history reaching back an eon, of different foods and ways to sleep—and of people so very much like us. If the sweet sorrow of parting is the yin, the joy of returning home is the yang.